Tuesday September 29th 1891 It was quite pleasant today. Mother and I made a lot of peach butter this forenoon from peaches Will got yesterday. I done some ironing too. In the afternoon we knotted a cotton bed and in the evening Will and I went over for things and I was down to see Ott & Fanny a little while. Wednesday September 30th 1891 I was busy all morning with baking and helping Mother do up some plums and then Agnes and I done some extra work up stairs. Will finished fixing the road on the north hill and took the trader home. Fanny was over and took Mrs Fulkerson to town. After dinner Will took Mother, Wm F --- and I down to Aunt Ems. We left Mrs F--- there. Got home in good time to get supper. I wrote most of the evening. Thursday October 1st 1891 We got our work done up nicely and a good dinner ready. Mary Woolf and Mrs Frank Woolf were here for dinner. Will went out to Moons sale. I worked on fascinators and finished as many as Moore wants. 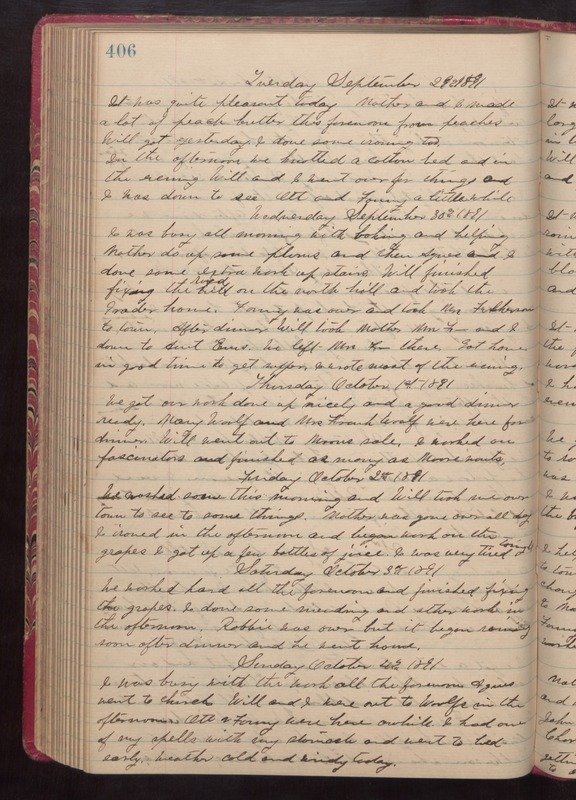 FRiday October 2nd 1891 We washed some this morning and Will took me over town to see to some things. Mother was gone over all day I ironed in the afternoon and began work on the grapes. I got up a few bottles of juice. I was very tired tonight. Saturday October 3rd 1891 We worked hard all the forenoon and finished fixing the grapes. I done some mending and other work in the afternoon. Robbie was over but it began raining soon after dinner and he went home. Sunday October 4th 1891 I was busy with the work all the forenoon. Agnes went to church. Will and I were out to Woolfs in the afternoon Ott & Fanny were here awhile. I had one of my spells with my stomachs and went to bed early weather cold and windy today.